A Hearts & Arrows (H&A) diamond can be thought of as the Rolls Royce of diamonds. Essentially, it's a perfectly cut round diamond. Now, this isn't something every diamond shopper will care about. Just like some people are fine with Ralph's steak, while others want beer-fed, hand-massaged Kobe beef. Some people want the largest diamond they can get for their budget. And some people want quality over size. If you're one of those people who want the absolute best quality, then read on. A Hearts and Arrows diamond will appeal to you. But you need to know what to look for. What Is Hearts and Arrows? In the 1980's, jewelers noticed that round cut diamonds have a special pattern. When viewing the diamond with a special viewer (called an H&A viewer), you could see interesting patterns. The top looks like 8 arrows, while the bottom looks like 8 hearts. They also realized that by cutting the diamond in a very precise way, the hearts and arrows pattern can be perfectly symmetrical and crisp. 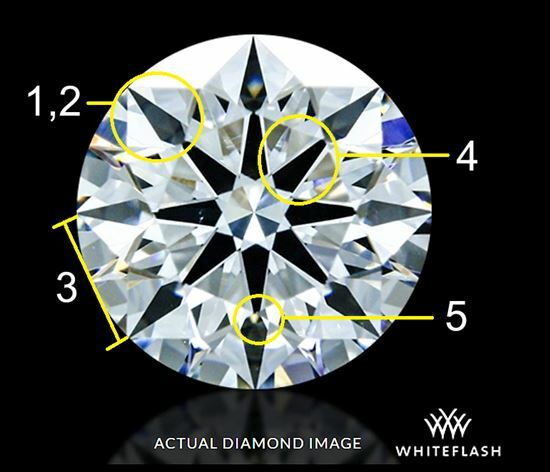 So while all round diamonds have a pattern to some degree, only the ones with perfectly symmetrical cuts are called true H&A diamonds. Only about 1% of all the world's diamonds can be considered true H&A. Creating this perfect pattern is not an easy process. Jewelers must cut each facet to precise angles and proportions. The stone must be completely symmetrical. Then the stone must go through an extensive polishing process. Only an extremely skilled cutter can achieve a precise hearts and arrows pattern. With a hearts and arrows diamond, you'll see a pattern consisting of eight arrow shapes when looking at the diamond from the top (called the crown). It looks like an eight-pointed star in the center with 8 arrowheads on each tip. Each arrow should look identical and be the same size. The arrow tips should all be defined clearly. They should be spaced the same distance apart. Each shaft should be the same length and thickness. The interior arrow shafts should match up with the arrowheads. When you look through the diamond from the underside (the pavilion), you'll see the repeating hearts pattern. You'll see what looks like an eight-pointed star, with a heart shape between each point. Hearts should all be uniform and the same size. Each should have clearly defined tips. The clefts of the hearts should be well defined and have no splits. There should be a V-shaped gap between the bottom of each heart and the center of the "star." Gaps should be crisp and all be the same. Hearts should be one color. No discoloration. If a diamond has perfect hearts, it will have perfect arrows as well. So usually, jewelers will only look at the bottom for the hearts. Now let's compare a true H&A diamond with a near H&A diamond. So you can see the difference. A slight split in the cleft on a couple of hearts. It's a bit more obvious on the heart at the 10 o'clock position. The V-shaped gaps are not all the same. You can see it is clearly not symmetrical on the heart at the 5 o'clock position. But it's still an excellent diamond with great light performance and beauty. It's just not a true H&A. In all honestly, the average person wouldn't see a difference. So it's completely up to you whether you want to spend the premium on a true H&A. Is H&A the Same as Brilliance? Hearts and Arrows is the product of a perfectly precise and symmetrical cut. But it's not what causes a diamond to sparkle. Brilliance is based on proportions that affect how the light bounces off each angle and facet. H&A is based on symmetry of the diamond and its facets. For a diamond to exhibit maximum brilliance, it needs to be cut with the perfect proportions, angles, and symmetry. When that's achieved, the H&A pattern will naturally form. H&A is almost like a side effect of a perfectly cut diamond. So they usually go hand-in-hand. But having one doesn't mean the other is automatic too. For example, the diamond can be perfectly symmetrical with an H&A pattern. But the table depth could be off, which causes light to leak. So even though the diamond is symmetrical, it'll be dull and not sparkle as much. On the other hand, an excellent cut diamond with superior brilliance could have some facets slightly out of place. This wouldn't give it the perfect H&A pattern. When a diamond has 1) superior light performance AND 2) perfect optical symmetry (H&A), then it's called a super ideal diamond. Are Excellent/Ideal Cut Diamonds Always H&A? GIA's top cut grade is Excellent, and AGS's is Ideal. 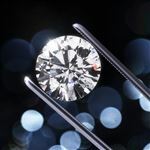 Many shoppers are confused and think that a diamond receiving a top cut grade is automatically an H&A diamond. This is not true. Heart and Arrows diamonds go beyond the criteria needed for Excellent/Ideal grades. Excellent/Ideal diamonds are graded based on light performance and proportions. They don't need to be perfectly symmetrical with clear H&A patterning. In the example above, the near H&A diamond was graded Excellent by GIA. Think of it as a test where anything over 90% is given the grade Excellent. But an H&A diamond must score a perfect 100%. The diamond has more value. Because of the precise cutting and polishing required to create a true H&A diamond, they're very rare. So your diamond is more special, and it should hold its value well. It means the diamond has been cut precisely. If the diamond is an H&A, you can be certain that the diamond has been cut and polished with precision and care. As we mentioned, a hearts & arrows pattern is the by-product of a perfect cut. So it's generally accepted that an H&A diamond means a super ideal diamond. Tip: Make sure the diamond is certified by a reliable lab. Usually, hearts and arrows diamonds are certified by AGS, as they're the leading laboratory for certifying diamond cuts. There's a romantic factor. The name says it all. It's romantic to present your darling with a hearts and arrows diamond. It's a bit of a marketing ploy. Sure, a hearts and arrows diamond looks cool. But to truly view this pattern, you need a special viewer that you're not going to have just lying around at home. And you need to view the loose diamond to see it, which you won't do once it's mounted on a ring. 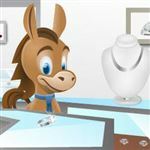 In addition, the marketing effort behind H&A diamonds has been so intense that some people think they want one, but they're unsure what exactly it is. 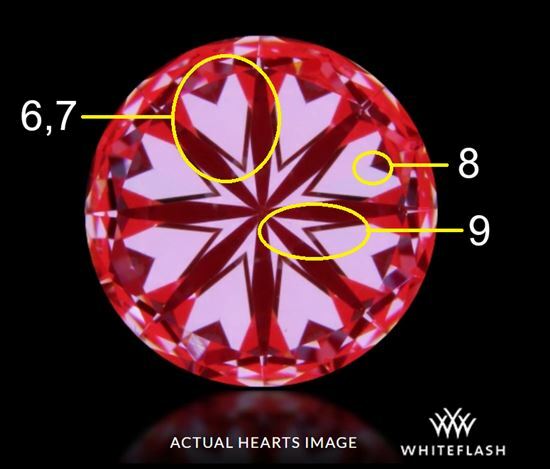 Some diamonds claim to have this pattern, but they are miscut slightly. When a jeweler doesn't quite get the cutting and polishing process accurate, the pattern will show up, but it won't be a true H&A. A normal shopper is not experienced and you mostly likely won't see the slight imperfections. Jewelers use the term H&A loosely, so you could be fooled into believing you're buying a true H&A diamond. Tip: Labs don't label a diamond as H&A on their report, so you wouldn't know for sure. The only way is to look at the diamond through an H&A viewer and know what you're looking for. 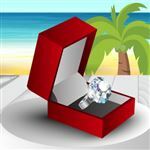 A trustworthy jeweler will provide you with all the data to prove that the diamond is true H&A. Make sure you're provided with all the light performance data (Idealscope, ASET) and H&A imagery. They're more expensive. Because of the immense skill required, H&A diamonds are sold at a high premium. If you're just after maximum brilliance, you don't necessarily need the hearts and arrows pattern. A diamond can sparkle beautifully if even it's not H&A. Whiteflash. Whiteflash is especially known for their signature A CUT ABOVE® super-ideal cut diamonds. These are their H&A diamonds that have received perfect ratings in light performance, symmetry, and polish. If you don't quite have the budget for that, Whiteflash also offers a great Expert Selection. This contains diamonds that just didn't quite make it into the A CUT ABOVE® line. You can find a high-quality diamond for a more budget-friendly price. James Allen True Hearts: This is James Allen's line of hearts and arrows diamonds. But they're not always true H&A. They're near H&A. But they can still be considered almost perfect diamonds (99% instead of 100%). The good news is that near H&As are a little cheaper. Brian Gavin. You cannot talk about super ideal diamonds without mentioning Brian Gavin. He is the most well-known pioneer and leading authority on hearts and arrows diamonds. All of his diamonds are cut to the most exacting standards for the best light performance. He offers true H&A diamonds in round and even cushion cuts. The unique thing about Brian Gavin is that it has several product lines to suit every budget. H&A diamonds will appeal to those who want the very best. Just understand that you will pay a premium. As long as you know that you can get a beautiful brilliant diamond without the H&A, if you still want one, then that's totally your choice. Superior light performance and H&A usually go hand in hand. But remember, they don't automatically come together. So make sure you get the light performance data as well. There's no point in having a symmetrical diamond if it's going to be dull. Share on Facebook "Hearts and Arrows: Should It Make the Cut?"